“I am very honored to have been named dean and am enthusiastic about working with the faculty, staff, students and alumni to mold our programs to meet the needs of a 21st century global society, while preserving Auburn’s historical strengths in veterinary medicine,” Johnson said. He becomes Auburn’s seventh veterinary dean since the college was established in 1907; the veterinary medicine program began at Auburn in 1892. He succeeds Boosinger, who served as dean for 16 years until 2011, when he was named Auburn’s provost. Johnson was acting dean for 17 months, followed by Fred Hoerr as interim dean for four months. “The college has built a solid foundation through 121 years of exceptional education and leadership in veterinary medicine, including companion animal health, agricultural production medicine, biomedical research and the interface between animals, humans and the environment,” Johnson said. A 1979 graduate of Auburn High School, Johnson earned his bachelor’s degree in 1983 and his veterinary degree in 1986, both from Auburn University. He earned his Ph.D. in veterinary medical science (pathology) from North Carolina State University in 1992. 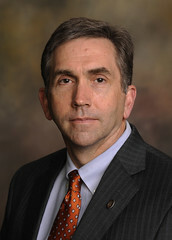 Johnson is chair of Auburn University’s Health Sciences Task Force and serves on numerous other university and college committees. He is a diplomate in the American College of Veterinary Pathologists, being board-certified in anatomic pathology, and in 2012 he was named Mentor of the Year by the national Student Chapters of the American College of Veterinary Pathologists. His primary research areas involve the pathogenesis of feline immunodeficiency virus infection and veterinary immunology. He and his wife, Mary, live in Auburn and have a daughter, Frances, an Auburn pharmacy student, and a son, Gardner, an Auburn civil engineering student. Johnson’s father, the late Wiley C. Johnson, was an emeritus professor of agronomy in the College of Agriculture. His mother, Elizabeth Johnson, is a resident of Auburn.